I love this toilet paper holder. Somebody ask if the screws show on top. No, they do not. I have put three of them together. When I moved, I had to leave them at the house as I used them as built in, one on top of another. I used the bottom one for toilet paper. I used for soap, washcloths and lotions that I used for bathing. The third one I sent to my daughter, she loves it too. I am sorry to say when I moved here I bought one for 1\2 the price in another catalog like Miles Kimball. What a mistake , it was cheaper and no shelves for toilet paper, cheaper wood, flimsy backing. ??. If you are going to buy one go with Miles Kimball, quality is so much better. Easy to assemble! Great fit for my bathroom. Just what I was looking for. I love it. it fit right in a dead space and make it bright. I have one of these which I altered slightly. I did not use the shelves, and since I don't use the square tissue boxes, I glued one of the shelves below the tissue opening to block it. i can now store 5 mega rolls of toilet tissue in easy reach. With the shelves, can store many small items, like bottles of supplements, toothpaste, and other health and beauty items. Ideal For Charmin Mega Rolls! 103081430,5,Where have you been all my life !! !,After years of putting small covers over the arms and a large pillow sham over the back -- all of which constantly slid off -- I'm thrilled to have found this EXCELLENT recliner cover. No slipping off. Plenty room to tuck in corners. Bands provide a secure non-slip fit. I'm 5'1" 200 pounds and it totally stays in place !!! And it feels great -- soft and cushiony. Pockets are great !!! It's reversible (pockets on the reverse as well) and waterproof !!! I did test this out with drops of water which just rolled off. When I rubbed them in the underside stayed dry. Definitely a win win !!! I think it's also supposed to be stain resistant. If so definitely a win win win !!! Love it !!! I would buy this tissue tower again. I have a very small bathroom just off of the laundry room. I have been looking for something that looked nice and would fit in a small place for the toilet tissue. This "tower" is perfect. The only reason why I did not give it a 5 star rating is that my rolls of of toilet paper are slightly bigger than normal and the door does not close tightly. I wish the tower was 1/2 inch deeper. For the price it's a nice cabinet especially for a small bathroom like ours. 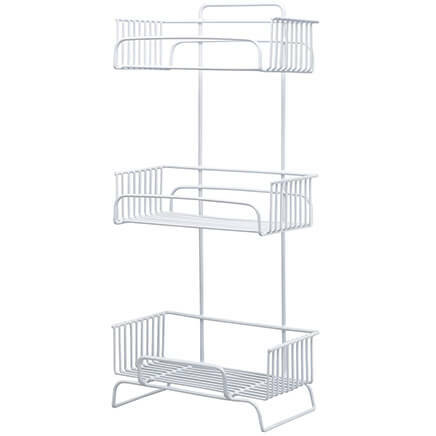 Great for extra storage, assembly pretty easy. Screwhead "stickers" look cheap and could be better. I did use the stickers, used white filler instead. Looks good in bathroom, and handy for that extra srorage use. We bought it for extra storage and it fills this need perfectly. 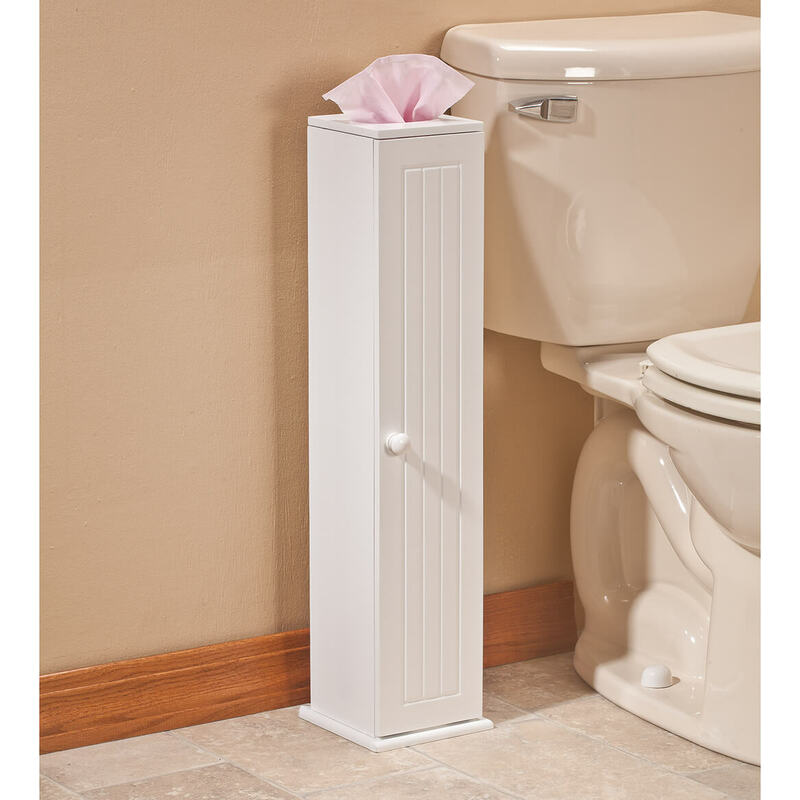 I love this tissue tower - the appearance is very pleasing and having the tissue dispenser on the top is so smart. The detail on the front is charming. The instructions included are not so good, you basically have to figure out how it all goes together yourself. It does have a parts list that is good, so you know you have all the pieces, but the instructions are just a bunch of arrows. The product was so easy to assemble. It really only took me about 15 minutes. It was missing the little magnet that went in the door. My biggest disappointment is the fact that it doesn't hold the lager rolls of toilet paper only the little rolls. Also the screw covers for the top are just little plastic sticky tape. I'm going to replace that with white Spackle. I think it's a little over priced for the quality. I needed a small holder for a small bathroom with little storage. This is ok for my use. AS others indicated assembly was based on your intuition as there were no step by step instructions. As a result it took longer to assemble that should have been necessary. Mine came without any instructions or picture diagrams. Each part was labelled with a letter, so you are pretty much on your own when putting together. I always buy the larger rolls of toilet paper, and they don't fit into the shelves really good. I will have to go and buy a magnet type latch to keep the door closed. Other than that, it's a nice cabinet for which it's designed for. No step by step instructions; just a list of all the parts & sort of a picture of how it goes together~!! I needed something small for my bathroom. Ordered one but when it came the corner of the door was broke. Sent it back and they sent me another one.The corner was broke some on this one, But not as bad. Love the cabinet, its just what I needed. Not sending it back again, but wish they would check it before they send it out. Maybe it was done in shipping don't know. Functional, but cheap stickers over construction screw hole? 1. non-existent assembly instructions. I'm pretty mechanical, so it was not really hard to figure out, but others may have a difficult time doing it. 2. you cannot see it in the photos, but there are several screw holes visible after assembly that make the product look very cheap. Their solution - cheap white stickers to cover the hole - making it look even cheaper. You build and sell furniture and cheap stickers is your solution? 3. was missing a shelf (Part# F). Contacted the customer service and they are supposed to send me another shelf - will see what they decide to do to resolve this without another call to their company. One reviewer said new megarolls accommodated. It took me a long time to figure out how -- I had to remove the shelves to allow 4 rolls to fit on their sides. When I called to complain, the customer service rep said that there was nothing in their ad that said that mega rolls would fit. My husband said there was no instructions as to which order to assemble it. Screws for hinges too tight and some of the other screws were too loose. Very useful to hold toilet paper. I have two of these prior to this one which looks great in any bathroom. The other two are put together nicely and no screws are showing when putting them together. This one shows all the screws on the outside and makes it look cheap. Holes did not lineup for dowels. Much smaller than I thought. Great idea for a small space, but for the cost I expected more. Moving to a house with a smaller bathroom and this purchase is something that is perfect for my needs. I hope this is as functional as it looks. I'm redoing my bathroom, and trying to organize better. This will get the rolls off the floor and make my bathroom nicer. I think I may paint some flowers and birds on it. We needed a small cabinet to keep extra rolls of toilet paper in one of our bathrooms. I also wanted something to hide the toilet brush, so with the adjustable shelves I can customize it. I also like to have things contained and easy to clean and this should be easy to wipe off and move to clean the floor. I will save space by combining my kleenex and toilet tissue in one place. Compact size - allows me to keep extra toilet paper and make up bag out of sight. I am actually going to use this in my new kitchen to hold some plant food etc. It will keep it away from the food items. Can ALWAYS use kleenex in the kitchen! Very little space between side of toilet and wall. This slender cabinet should fit well and the style matches woodwork in bathroom. I have a very small bathroom with no place for extra rolls of toilet tissue. This item fits perfectly and is easy to put together. I love it! This item is just perfect for my bathroom set up. Because of the size and that it will fit in the area that I wanted something to hold items. For the reasons shown in the picture and it matches my white cupboards in my bathroom. I chose this item because I have one and it works marvelous. Purchasing this for a birthday present for my daughter as she likes mine so well. Need new toilet paper holder for bathroom and this appears to be a nice tidy solution. My daughter has one and I've been hoping to find one too. It doesn't take up much space but is truly useful. We needed something like this for the master bath, and it's plain lines will blend reasonably well with our mid-century modern home. Not perfectly, but well enough. It's a great organizing tool for the bathroom. It will complement my toilet bowl butler ! Needed a new toilet tissue holder and this one seems to fit the bill for a small bathroom with limited available space. 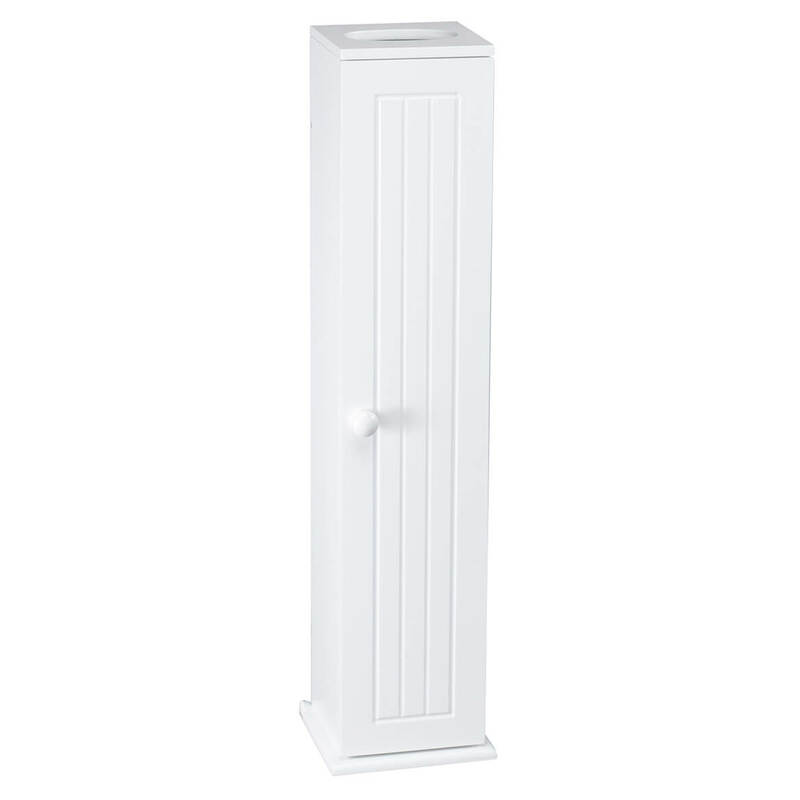 I have a very small bathroom and I am hoping this little cabinet will fit between my commode and the sink without looking cluttered. Same as 3 and 4, for the bathroom. Great size for a small bathroom. My husband put this together. It looks nice. However, it does not fit the mega size toilet tissues that I buy from Costco. I might have to buy a different tissue brand which I'm not too happy about. 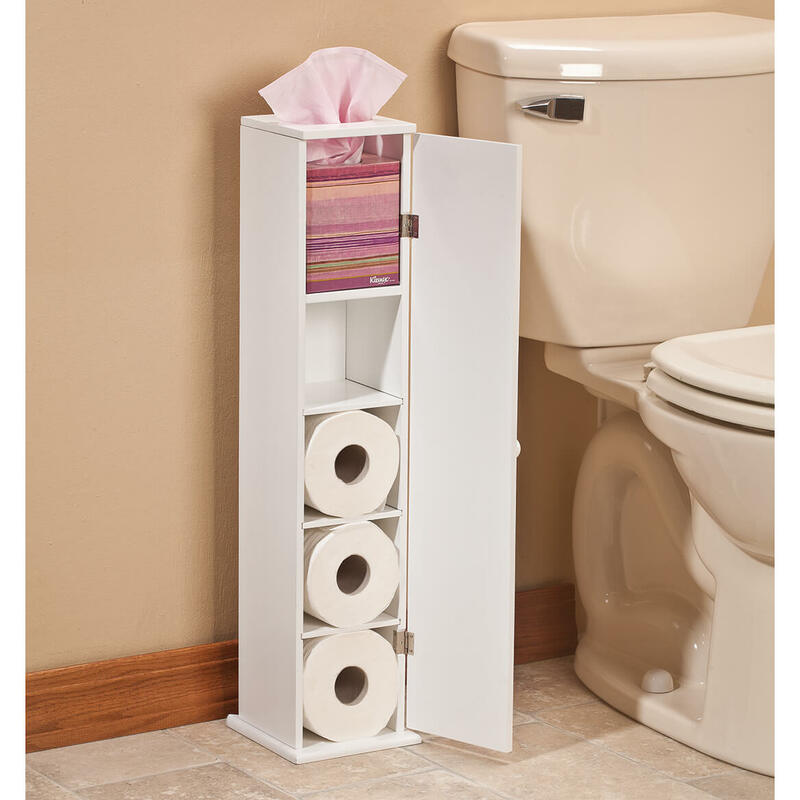 I needed the toliet tissue storage tower. It's not exactly what I wanted, but it will do. I didn't need the kleenex holder on top. 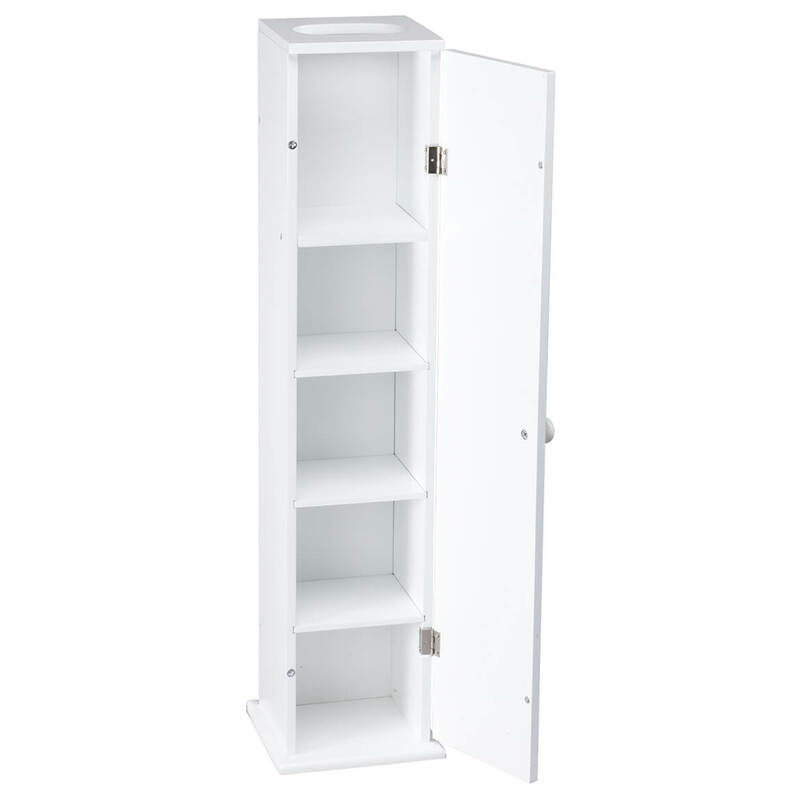 But this kind of storage cabinet is hard to find. This was the day to purchase it. I'll be satisfied. I would like to see a white wood vegetable bin that sits on the floor at a reasonable price in the future, to hold potatoes, onions etc with a flat top to put a plant on top. Have very small space in bathroom. This will fit. I have a small bathroom without a closet; this tower will fit into a small space in the bathroom. I have two I love them. BEST ANSWER: I did it my self and felt it was simple to put together. Not difficult, but use a small phillips screwdriver. what size in inches is the depth of this item? BEST ANSWER: Thank you for your question. The base is – 7 ¼” w x 6 2/16” long (front to back).We hope this information will be of help to you. Thank you for your question. We have reviewed the item and see that it is 2"6 inches high. We hope this information will be of help to you. BEST ANSWER: The shelves are not adjustable. They slide into pre-made slots in the side walls. And you need to load the t-p on the shelves sideways. The whole unit does look a lot better than the t-p plastic tube unit-unit-with-cover that I used before I purchased this little cabinet. Are there exposed screws on the top of the cabinet? BEST ANSWER: There are four small exposed screws on top, but they screw flat on the top of the cabinet and you hardly notice them. no,there are small stickers to cover them. What is the height of the toilet paper storage unit? BEST ANSWER: Thank you for your question. The tower is 5 1/2" W x 27" H x 6 3/4" L. We hope this information will be of help to you.